Easy Cheesy Garlic And Herb Breadsticks. 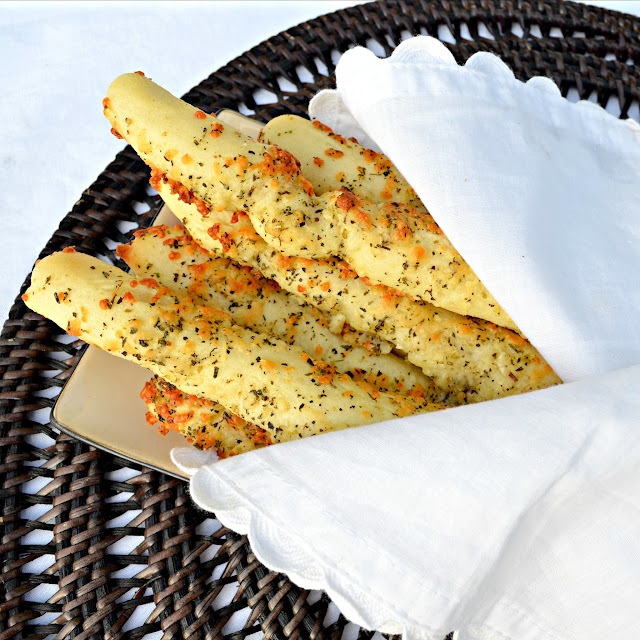 I love breadsticks and every so often I make these for my fabulous family as a treat to go with dinner. Warm and crunchy on the outside. Soft and chewy on the inside, could anything be better? Oh, wait don't let me forget the cheesy garlic and herb coating. I love that I can make these ahead and leave them in the refrigerator and pop them in the oven later that day or the next. Next time you have Italian night, soup night, meatloaf night or any other night make sure to make some tasty Easy Cheesy Garlic And Herb Breadsticks! In a large mixing bowl fitted with a dough hook add warm water, honey and yeast. Allow to sit for about 5 minutes until yeast is bubbly and active. Add flour and sea salt. Knead until smooth and elastic on medium setting about 8 minutes. Optionally you can mix by hand and knead until smooth and elastic. Cover dough and allow to rest for 35 minutes. Divide dough into four. Divide each fourth into six. Roll each portion of dough into a 6-8 inch long rope, dependent on whether you prefer a thicker chewier or a thin and crunchy breadstick. In a food processor add parmesan cheese, oregano, rosemary and thyme. Pulse together until crumbly. In a large dish melt butter. Add fresh minced garlic and garlic powder. Mix well. Roll uncooked breadstick in butter mixture. Then roll uncooked breadstick in cheese mixture. Place about 3 inches apart on a baking sheet. At this point you can cover and refrigerate for up to a day until ready to use. Preheat oven to 400 degrees and cook for 15-18 minutes or until brown on the outside and cooked through. Remove from the cookie sheet immediately. Easy to make Cheesy Garlic and Herb Breadsticks from Serena Bakes Simply From Scratch. In a large bowl fitted with a dough hook mix warm water, honey and yeast. Allow to sit for 5 minutes until yeast is bubbly and active. Add flour and sea salt and mix until smooth and elastic on medium. Alternately you can mix everything by hand in a large bowl and knead until smooth and elastic. Cover dough and allow to rest for 30 minutes. On a floured surface divide dough into four. Divide each fourth into six. Roll each section of dough into a 6-8 inch long rope. The shorter the rope the thicker and chewier the breadsticks, the longer the rope the thinner and crunchier. In a food processor add parmesan cheese, oregano, rosemary, and thyme. Pulse until mixture is crumbly, and resembles bread crumbs. Place in a large dish. Mix butter, fresh, and powdered garlic in a large dish. Dip breadstick dough into butter, and then into cheese mixture. At this point breadsticks can be covered, and refrigerated for up to a day, until ready to use, or cooked immediately. Bake in a 400 degree preheated oven for 15-18 minutes, or until cheese's is brown, and the inside is cooked through. Remove from the cookie sheet immediately. Wow! They look so good to munch on! Love all the added herbs! These look so much more tastier than the one's out of a box. My guys would love these! Hope you're having a great week! Serena: I want these delicious-looking breadsticks in a big glass on my table! Thanks for sharing the recipe. These are amazing! I love the cheesiness! they look perfect. Very nice color . I could fill up on your garlicy herbed breadsticks alone...A nice bowl of marinara sauce for dipping and those breadsticks and I'd be one happy camper! I can see how these would get snapped up instantly in any household! Oh they look so delicious!I should try some day with gluten free bread dough. Serena these look absolutely lovely! Every time my whole family comes over I always end up cooking Asian dishes and I've been thinking about mixing it up and doing an Italian night...I think I just found one of my dishes! Pretty! And I'll bet they taste great too. Thanks for sharing the recipe. They are easy to make and so darn tasty! These were delicious and very easy to make! Super recipe! Thanks! Garlic and those herbs make breadsticks lovely. The pictures are also great. Thanks. These are so tasty! I forgot to add the garlic to the butter, and it still tastes amazing! !